Shawn Combs is a 39-year-old mechanical engineer who spent most of his career working in the energy industry. His assignments included working at the Knolls Atomic Power Laboratory and working on nuclear propulsion for US Navy subs and aircraft carriers. For the last five-and-a-half years, he has been the rod designer for Orvis. The following are a few additional points we touched on. RM: How do you see the (rods, reels, lines… ) industry evolving? SC: I see a trend toward usability and comfort. Rods that cast fishing distances better, lines designed to help deliver flies in unique applications and reels that do more than just hold lines. 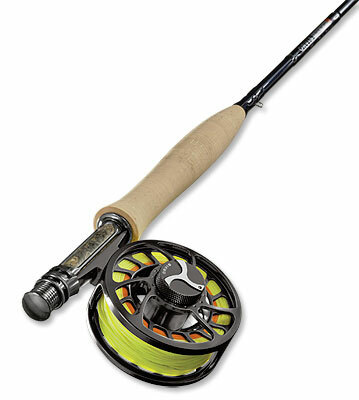 RM: When you read customer feedback, what is/are the most common misconceptions they have about fly rods? SC: That car doors don’t break rods! Seriously, rod design language. The consumers and manufactures sometimes jumble up words that describe rods. Words like action, recovery, flex, profile, taper, fast, full, and slow. My advice is to cast rods and fish rods when selecting a rod to purchase. We have been making rods since 1856. With that comes a lot of experience, innovation and best practices. Things like the thermoplastic resins and proprietary construction techniques we use in the Helios series set us apart from the rest of the industry. I’m most happy about the innovation opportunities in rod design and most of that technology trickles down into the other rod series. With five industry awards (and counting), Orvis’ Helios 2 fly rod was an attention-grabber at this year’s ICAST show in Orlando. 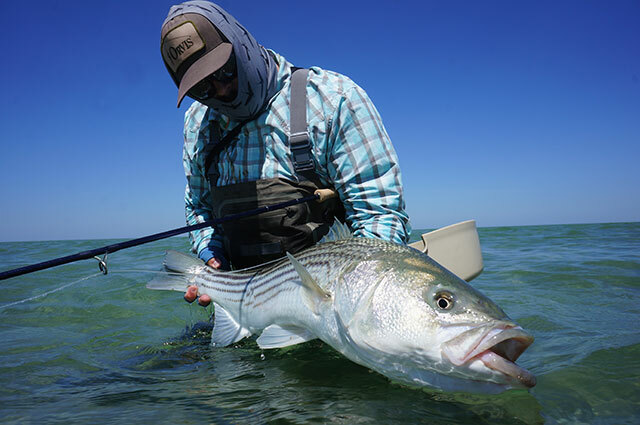 Some of the things that Orvis is saying about their H2s: They are 20% stronger than the original Helios, 20% lighter in hand, swing weight has been reduced by 20% from the original Helios, 100% increase in tip-impact strength, fine-tuned tapers for unrivaled tracking, accuracy, and lifting power and (my personal favorite), and has the backbone of an I-beam. I have the highest regard for Orvis. This is a company that has been perfecting its craft—many crafts, in fact—for a long time. Still, industry awards and unabashed fireworks-style marketing-speak aside, the Helios 2 is a fly rod that begs scrutiny. I obtained a corresponding Helios (version 1) rod, and the H2 weighed in at precisely 20% less than the first generation Helios, which was light to begin with. It’s pleasingly light, and will take a little getting used to if you’re using it to replace an older rod, say something from 2011 or earlier. I didn’t investigate H2 materials or build processes, but Orvis is clearly leading the way in light-weight wares. If you’re a weight-geek, then make a beeline for the Helios 2, you won’t be disappointed. And remember that H2 series rods pair up best with ultra-light reels. 100% increase in tip-impact strength? Yes to that. While I didn’t perform a breakage test, it seems the top few inches of blank have been beefed up. And why not, considering this is the most often damaged portion of a fly rod? You have to wonder why this wasn’t done a long time ago. I tested the rod with two different fly lines: RIO’s InTouch Outbound Short (built heavier than standard fly lines, with a short, powerful taper to deliver large flies) and Scientific Anglers’ Sharkwave Ultimate Trout. While it’s clear the H2 rods function best with heavier lines, they show no lack of versatility: casting the Sharkwave becomes a pleasingly connective task. This is in part because of the rod’s very sensitive tip, and also due to the rod’s low swing weight. Unless you’re using a lightly tapered line and adjust your drift, that “backbone of an I-beam” might take a little fun out of your short game, but that’s not what the H2 is all about: expect laser-like accuracy from then on, all the way to, conservatively, 60 feet. Longer casts are fairly effortless. Beyond that, this is an instrument that will dramatically assist in reducing false casting. I never understood the ultra-gloss varnishes that are applied to the majority of fly rods, single-handers that are often used to target fish that are close by. All this talk about stealth and here we are, waving mirror-finished 9-foot rods in the air. Thankfully, the H2 blank sports a satin finish. Well played, Orvis. Other rod manufacturers should follow suit. The Helios 2 is a premium fishing instrument, so you can expect all of the goods: overall construction is meticulous and the rod sports an extra fancy cork grip, REC Recoil stripping guide followed by crush-proof Recoil snake guides, alignment dots, slim ferrules, UV protective paint on the blank, and a top-tier rod tube (see the Orvis website for a complete list of specs). Final note, for those who care about cosmetics: freshwater models sport reel seats that look like they’ve been lifted from $2,500 custom rods. In a word, they’re stunning. REC woven graphite reel seats and black nickel skeletons appear on saltwater models.